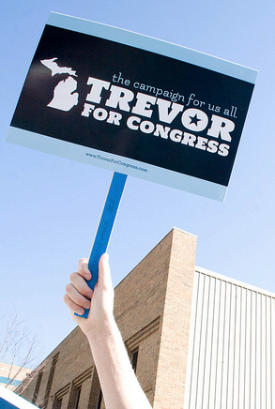 Facing a well-financed establishment Democrat, Trevor Thomas has mounted a spirited campaign in Michigan’s 3rd Congressional district. While Steve Pestka has been racking up endorsements from an array of long-time Democrats in our state, Thomas himself has earned a string of solid endorsements of his own, proving his progressive bona fides. Former Kent County Commissioner W. Paul Mayhue Sr.
Today, the National Organization for Women (NOW) will announce their endorsement, as well. Funding for Thomas’s ad has been provided by nearly 3,000 individuals giving as little as a few bucks, with most donations less than $100. Additional donations will be used to purchase new ad spots before election day. 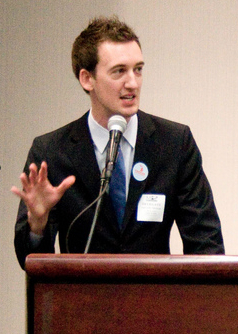 Thomas’s opponent has raised less money, and has contributed over $690,000 to his campaign accounts to defeat Thomas. Pestka has accepted PAC money in this primary campaign; Thomas has raised funds entirely from individuals, with no PAC contributions. While Steve Pestka has strong support from the establishment Democrats in Michigan, Trevor Thomas represents the true progressive in this race. In a year when it is critical that we send reliable progressives to Washington, D.C. to support President Obama’s second term, it is my hope that he prevails and goes on to defeat tea party candidate Justin Amash so that Michigan’s 3rd District is represented by the someone who can be counted on to defend the middle class, the rights of women, minorities and the LGBT community and of ALL Michiganders. His campaign’s tagline “A campaign for us ALL” is well chosen. It will be a race to watch next Tuesday. You can donate to Trevor Thomas’s campaign HERE. UPDATE: I have deleted the comments of a person who went by the name “WMResident”. This person is actually a Pestka staffer who spent an enormous amount of time on this specific post today, trashing anyone who disagrees with him (namely me and Trevor Thomas campaign manager Clint Wallace.) When I revealed his identity in two comments, he threatened to sue me. I have removed my comments and his and he is banned from posting again on this website. Just to be clear: Steve Pestka has campaign staffers trolling blogs that support his opponent and spewing anti-Thomas rhetoric, hiding behind internet secrecy. They’re a brave, bold group, these Pestka folks, aren’t they? The irony is that I didn’t say anything negative about Steve Pestka in this post. The closest I got to it was to call Thomas the true progressive in this race, a claim I stand by.